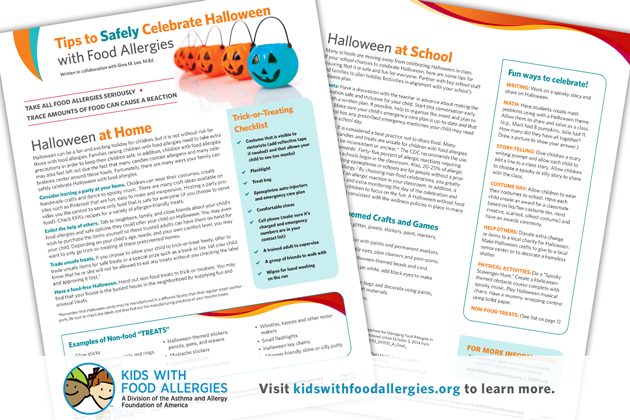 Holidays like Halloween that focus on food and treats can be stressful for parents and kids who manage food allergies. 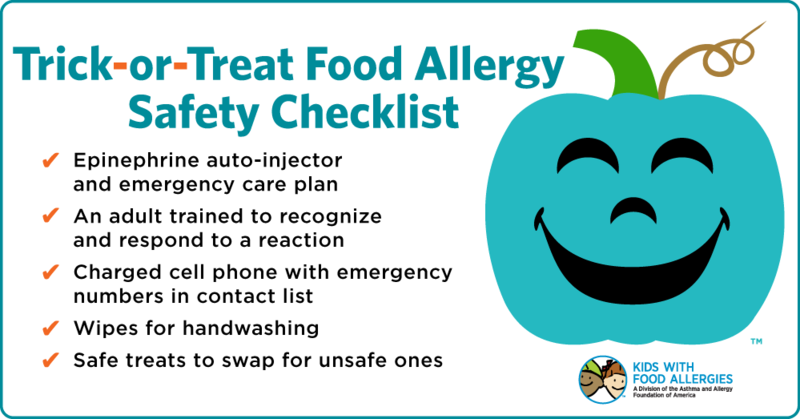 Preparing ahead can reduce that stress and minimize the chances of having a food allergy reaction. Here are our tips to make your Halloween safer and less stressful. If your child will be attending Halloween parties or trick-or-treating with friends without you, make sure there is an adult who knows how to prevent, recognize and treat anaphylaxis. Communicate the importance of reading labels and avoiding cross contact. Review your child's Anaphylaxis Action Plan with the adult who will be responsible and give them a copy of the Babysitter Drop Off Form. If your child is older, they can help communicate to their friends and families. Teach your child the importance of not eating any treat if there is any doubt about whether it might contain your child's allergens. Teach your child to look for their allergens on labels and to have a trusted adult carefully read all labels before eating any treats. Ingredients and processing can change at any time. Many times, seasonal candies are processed differently than the year-round versions. Many "treat-sized" candies are not labeled with ingredients or advisory warnings on the individual packaging. Use our checklist to get ready for trick-or-treat. Whether it's a class party, trick-or-treat pre-party or post trick-or-treat snacking, make sure your child will have something safe to eat. You may not be able to read labels and verify that treats brought by others or collected during trick-or-treat will be safe. Have a few fun treats on hand that you know are safe for your child. Get ideas from our Top-8 Free Halloween Candy Guide and allergy-friendly Halloween snacks. For something really fun, make these Teal Pumpkin SunButter® Crispy Rice Treats. These are easy to make and the kids can help decorate them with melted chocolate. You can individually wrap them to prevent cross contamination. Download our Tips to Safely Celebrate Halloween at home and school handout. Join our community to follow our blog for more tips to keep kids with food allergies safe and included at every holiday.